The following is a conversation that my friend Margo Dalal and I had about the closing of Goodwell’s Market. Michele: “Pocket sandwich with avocado and cheese.” For an indecisive person, figuring out lunch can be a difficult prospect. What I loved about Goodwell’s is that I always knew what to order and, when lunchtime rolled around, I always knew where I wanted to go. So when Goodwell’s closed its doors abruptly and without explanation about a month ago, it left a bad taste left in my mouth. And if the conversations I’ve had with dozens of other Detroiters this past month are any indication, I’m not the only one feeling a little hurt, a little sad, and a little hungry for more than what we got when Goodwell’s went goodbye. Margo: I am not angry that Goodwell’s closed, I am upset that I could not help, even if I wanted to. I am sad that there is one less place where Detroiters, new and old, could come together for an affordable and healthy snack. One reason I really loved Goodwell’s was the diversity in their customers. I loved to eat there and people watch, have a nice conversation with a kind senior gentleman, or sit outside and spontaneously see people I love. Michele: First let me say that Goodwell’s doesn’t owe me anything, not really. They were a for-profit business that gave me what I paid for every time and more. But, while there is no explicit violation, an unspoken social contract was broken with this abrupt departure. When a business establishes itself as a gathering space for community, when it becomes a mainstay of affordable, healthy, mindful food, we come to rely on it and that trust should be rewarded with open communication.One afternoon in early spring, I found myself in Southwest Detroit with an extra 15 minutes. I took the opportunity to stop into Café con Leche to get a cup of coffee. As I was standing in line, I noticed a matter-of-fact sign that said “Tomorrow will be our last day of business.” I was absolutely dumbfounded. First of all, that they were closing, but secondly, that they could close without letting me know! I know that implies a certain level of ego to think that they should tell me, but that’s how I felt. Café con Leche was a central part of my life when I first moved to Detroit and I saw time and time again how important it was to untold numbers of other people who lived in the neighborhood. It was an anchor to Clark park and to the community. A recent move and a new job have meant that I was spending less time in the shop but my art was about to be hung on the wall (I thought) and I took it as a given that this place would be there for me, as it was for so many others. Margo: When I first heard rumors that Goodwell’s had closed, I eased my inner tension by stating it as temporary, that they were renovating- which was the going rumor at the time. Later when I read how confused the community was in a Facebook comment thread, I realized that I was not the only one concerned at the lack of information. After I accepted the finality of Goodwell’s closing, I bought flowers to leave at their doorstep. When Staples on East Jefferson closed last winter, I was so upset. It was my trusted place for office supplies and suddenly I was left having to trek elsewhere. After complaining, I realized how shortsighted I sounded. This was my first experience of a place I relied on in my community closing. 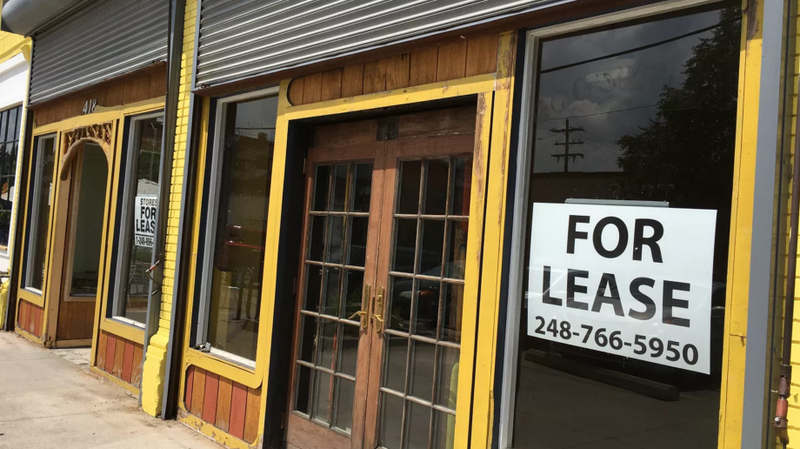 Here I was, a new comer to Detroit with no experience of seeing businesses close. Michele: Last year, the community stepped up and supported Café con Leche in a crowd-funding campaign, so there was an even greater sense of community involvement, community buy-in. Many donors may wonder where their money went or why there weren’t asked to give again if it could have meant saving their beloved café. Michele: By contrast, I’ve been impressed by the approach of Tyree Guyton proprietor of the Heidelberg Project. He has evidently decided to do what many would consider impossible (not just because of the effort, but because it unimaginable that it would go away) by taking down his extensive outdoor artscape. It’s hard to stay mad for more than a second, though, when you read the thoughtful statement that he made which assures his extended community that this will be done in a “deliberate, conscientious way.” We have as much to learn from businesses that are run well as the ones that close well. Margo: I want to make this point, though. If establishments like Café Con Leche and Goodwell’s cannot stay afloat, for what ever reason, I wish for the right to know they need help before hand, and to know why when they ultimately close. Like any human, I crave closure with people and places I love. On an economic level, I am concerned for the stability of existing small businesses as new, larger businesses emerge. As a customer, I want to have agency in helping these businesses not just by being a patron, but helping at a time they need it most. A few weeks ago, Richie from Lo and Behold Records in Hamtramck posted on his Facebook that he needed help paying the rent that month, and encouraged people to come a listen to records and drop him a dollar or two. I appreciated that so much. I was sympathetic to his transparency, and maybe being honest helped him stay open. How can we as residents have the tools to support the establishments we love, not just for an expansion, or growth, but when they need it the most? How can we encourage a better way of communicating between business and neighbor? I worry for the inevitable “G” word, and also worry about my economic role. Michele: It’s important for me to remember that I truly don’t know the circumstances of these business closing. It’s entirely possible that these abrupt closures were intentional and well-thought-out decisions intended to prevent intervention from a disappointed meddling customer base. I like to think that the fact and the manner of the closures is not the result of pride but rather for a very good reason– maybe something new and better is coming, maybe there something we customers just couldn’t know or understand. But. I don’t agree with people who may say that we customers don’t deserve to know or don’t have a say. This entry was posted in Detroit, Politics/Social Concerns. Bookmark the permalink.